How to install NodeJS, NVM and Neo4j are beyond the scope of this article. 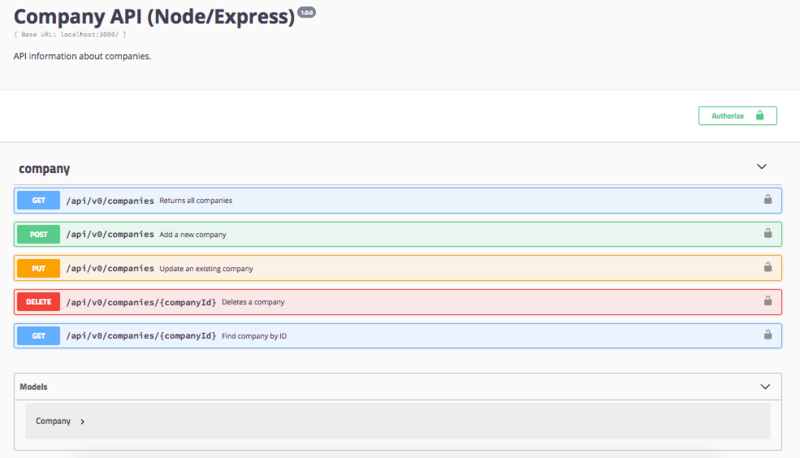 ExpressJS is a server-side web framework for NodeJS. It builds on the top of NodeJS. One of the important strength of ExpressJS is, it makes routing very easy. Furthermore, it is the most popular web framework in NodeJS world. Neo4j is a graph database management system developed by Neo4j, Inc. Described by its developers as an ACID-compliant transactional database with native graph storage and processing¹. It supports Cypher Query Language (CQL) to manipulate data in graph database. For this article, I will use docker to run neo4j instance. For this use case, I will create a service that can insert, update, list and delete a company data. The data will be stored as a graph inside Neo4j. I will create an express app with name expressjs-neo4j. First, I need to install express-generator in order to install a wizard to create project setup. Open a browser http://localhost:3000 to validate that your express is up and running. There are some modules that are necessary in order to make our service run based on its functionalities. For example, neo4j-driver module for database driver. There are many more modules to be installed. Setup the configuration file to configure database connection parameters and several initial values. There are several steps needs to be configured inside app.js. For instance, to enable authorization by using PassportJS, compress payload and expose swagger endpoint. See the source code for more details. For getting database session easier, I will create a utility file for database connectivity. Now create a model as a persistence layer to graph database. The other one to extract data from query results. Note: I extend the date property because neo4j date property is a little bit different. See how to get date in the neo4j/dbUtils.js for more details. Create a function to route service endpoint. * description: Company object that needs to be added to the system. ID will be replaced by system. * description: Unauthorized. Need JWT. Note: I embed the swagger-code-gen to generate documentation in swagger-ui. Since we activate the authorization, so we need to pass the JWT in the request header. One more interesting information, go to your browser and type http://localhost:3000/api-docs. You will get the list of your swagger documentation. That’s from me now. You can see complete source code, including how to run testing using karma and chai, on my github.